Is your school looking for Official School Uniform? 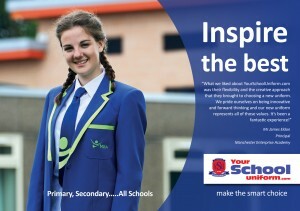 Does Your Uniform Reflect Your School’s Ethos? As a specialist school uniform provider, we supply all types of schools throughout the UK. Please click the images below to view online flipbooks of our brochures and catalogue. You can also e-mail these to your colleagues. 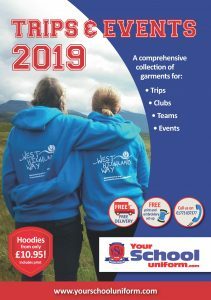 Our ‘Inspire the best’ school uniform brochure has been designed to give an overview of the wide range of garments that we supply to all types of schools covering all ages. 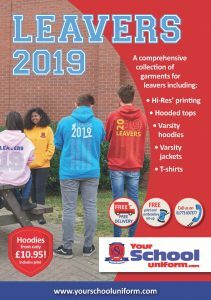 If you need inspiration or if you’re a new school, launching a new uniform, re-branding, changing your uniform supplier or service requirements, then this is the brochure for you. If you’d prefer to speak to us, call 01773 837377. 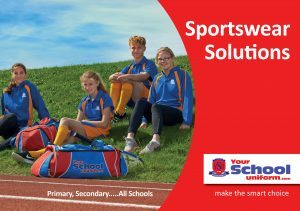 Our ‘Sportswear Solutions’ brochure has been designed to give an overview of the most popular sportswear, team kit and PE kit that is available to all types of schools and other teams and groups with an indication of prices. Many more garments are available. If you would like to discuss the sportswear in more detail, or if you’d like to tell us your specific requirements, call 01773 837377. Please take a look at the above brochures and catalogue. They include: sweatshirts, polo shirts, T-shirts, knitwear, shirts, blouses, trousers, skirts, pinafores, dresses, fleeces, hooded tops, jackets, blazers, ties, sportswear, team kit, PE kit, sublimated teamwear, staff uniform, bags, garments for leavers, trips and clubs and more… If you’d prefer to speak to us, call 01773 837377.